I’m sitting in Daisy’s front room, in the sun, when it hit me. I look around at the 8 other individuals in the room and I realise that we’ve become a theatre company. That over the course of a year we’ve developed through practice, hard work and most importantly a lot of fun, in order to come together as a team. In a way, this company is now something beyond the Lab Company scheme. But how did that come to be, I hear you ask? Well, I’ll tell you. It’s December, and 9 Lab Company members sit cross legged in a circle. A lot has happened. We’ve had workshops with some incredible theatre companies (on Thursdays) such as Bucket Club, Paper Birds, Propolis, Told By An Idiot, Pipeline (I could go on). We’ve also worked as Assistant Practitioners in the theatre’s Creative Learning department, and have now become quite adept at running workshops of our own. On Fridays, we work with Nik Partridge, the Staff Director at the Theatre Royal Plymouth, in exploring different styles and forms and investigating how we work as a group. We look over the crest of the hill and into 2017, and are eager to see what comes next. Flash forward again, to what comes next. It’s March, and 9 Narwhal Ensemble members warm up in TR2. 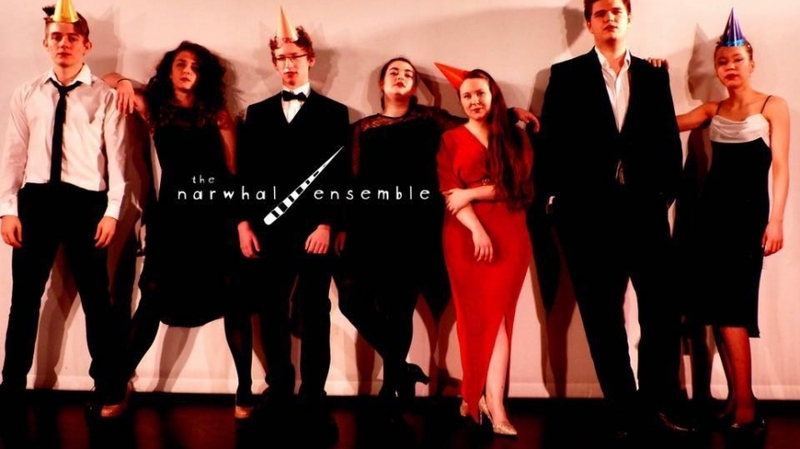 Who are the Narwhal Ensemble? Well, us. This is the company that has just formed, and it’s starting to feel like it’s taking a shape of its own. And, after finishing the Thursday workshops, our time is now devoted to developing Narwhal show numero uno. We have been given space in TR2 (where many of the professional companies who perform on The Lyric stage come to rehearse) in order to start our intensive R+D period. The show is getting ever closer. The company is forming. The Lab Company scheme is slowly moving to its final act. And now I’m back in Daisy’s front room, and the Narwhal Ensemble is practicing some beautifully arranged folk songs for our debut show, ‘Whey Down South.’ We’ve come a long way, over the course of a year. So why should you be interested? Well, the Lab Company is auditioning for next year! The Lab Company will give you invaluable experience of what it’s like to actually work in a professional theatre for a year. You’ll develop your skills not only as a performer, but as any myriad of roles that are key in the practical or creative life of a theatre. And most importantly, you’ll have a theatre company that understands the demands and rigours of the industry, and be kitted out with the knowledge of how to move forward after the year has ended. By the end of the Lab Company scheme, you won’t need the Lab Company scheme, and that is its strongest offer to you. John, from the Narwhal Ensemble.